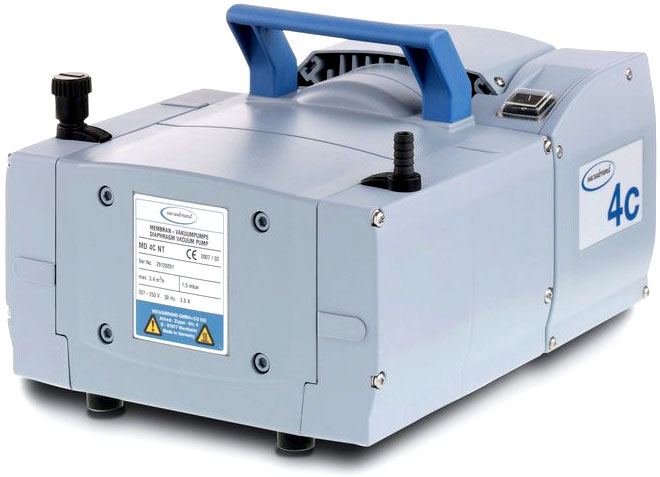 Vacuubrand MD 4C three-stage chemistry-design diaphragm pumps are an excellent solution for continuous, oil-free pumping of corrosive gases and vapors and meet even challenging requirements. The three-stage design provides the advantageous combination of high pumping speed and very low ultimate vacuum. All parts of the MD 4C NT in contact with pumped media are made of chemically resistant fluoroplastics. Well-proven PTFE sandwich diaphragms provide increased reliability and extended operating life. Due to the gas ballast valve and its very good ultimate vacuum (even with gas ballast) the MD 4C NT is also suitable for pumping condensable vapors of high-boiling solvents. The NT-series features further improved performance data, easy service and superior vapor tolerance.